Reading an article from the current issue of Time Magazine really makes one stop and think. At the beginning of the article, one sees a lovely color photo that, except for a few fashion details, could have been taken last week in Paris. 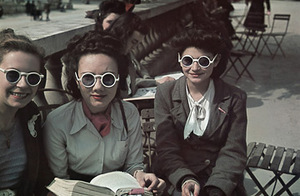 The photographs from the early 1940s show Paris as sunny, airy, bursting with color. Its inhabitants appear carefree, content and refreshingly unaware of their proclivity for looking très chic. It’s all very much at odds with the prevailing image of the French capital suffering and smoldering under the yoke of its Nazi occupiers. Indeed, that very dissonance has made the current photo exhibit “Parisians Under the Occupation” one of the city’s most controversial cultural events of late. Was life in Nazi-controlled Paris really as idyllic as these pictures suggest? The exhibit at the City of Paris’ Historic Library has drawn what organizers say is an unexpectedly strong turnout of 11,000 visitors since it opened on March 20. But in recent days the exhibit’s 250 photographs have become the subject of a heated debate over how history ought to be presented. “How history ought to be presented.” Well, now, there it is, right out in the open. Photographic evidence that life went on as normal for MOST people – exactly as it is doing today – is supposed to be suppressed so that we forget that nothing has really changed and that what is going on today is exactly the same as what was going on then. Detractors claim the curators neglected to inform spectators that the pictures were outright Nazi propaganda, commissioned and shot to show a German public just how happily the French lived under Occupation. That contextual omission, critics contend, not only allows the photos to broadcast a deceptive view of Nazi rule more than 60 years after they were shot; it also insults the memory of Holocaust victims from the traditionally Jewish right-bank neighborhood within the Marais, a stone’s throw away from the exhibit. The problem is, of course, that we have the same propaganda today – only better. Our television and newspapers and magazines show the public just how happy people are to be living under what amounts to exactly the same sort of Fascist repression as existed during Nazi times. Isn’t what we are doing insulting to the living (or dying, as the case may be) reality of over a million Iraqis, the hundreds of thousands of suffering Palestinians living under a far worse occupation of Zio-Nazis in their own land, not to mention all the other areas of the world that have been raped, pillaged and plundered by the Zionist controlled U.S. Secret Services, Psy-Ops and War Machine for the past 70 years or so? “It’s total manipulation, and it made me ill,” protested Christophe Girard, the Socialist deputy mayor of Paris in charge of cultural issues, in the weekly Journal du Dimanche Sunday. He has called for the show to be canceled before its planned end of July 1. What a sick hypocrite! This guy calls showing photographs of what life was like under the Nazis “total manipulation.” What does he call the U.S. claiming to bring “freedom and democracy” to Iraq by force, or the ongoing occupation of Palestine and genocide of its inhabitants? Frankly, that makes ME ill and it makes me even sicker to read pusillanimous platitudes promulgated by protesting Parisian Pipsqueak mayors who haven’t got the guts to stand up for people who are suffering NOW from exactly the same macro-social disease that gripped most of Europe under that gang of pathologicals called the Nazis. Well, guess what? Pathologicals exist in all kinds of places, parties, and behind all ideologies. France has been involved in some pretty pathological activities itself, to name North Africa for but one, and Viet Nam for another. Can we say “imperialistic occupation and genocide”?? But pulling the plug on the show isn’t going to happen, Paris Mayor Bertrand Delanoë said Monday night. Delanoë regretted that the exhibition hadn’t made more explicit the great suffering, privation, and death that amounted to the larger context for “people who also weren’t living too badly” in the photos. But he said canceling the show would constitute “adding a fault to errors,” and ordered its continuation. Thank god for a little sanity and truth. There it is: in the midst of the great suffering, privation and death that amounts to the larger context for Palestine and Iraq and Africa, Central America, Viet Nam, South America, and so on, almost daily genocide ongoing for the past 70 years, there are a lot of people who aren’t living too badly. And that was a fact then, and is a fact now. Nothing has changed, just the names of the perpetrators and the victims. It’s always and ever pathologicals in charge and decent people of conscience who suffer, and the rest turning their eyes away for fear that they, too, will get trapped in the jaws of the beast. By the time Delanoë made that call, the curators had moved to provide that context. Visitors to the Historic Library are now informed in several languages that the pictures were shot by André Zucca, a Frenchman hired by the German magazine Signal to capture scenes of Paris flourishing under Nazi rule. Zucca’s bosses’ gave him extremely rare and valuable rolls of Agfacolor film to shoot his busy shoppers, café-lounging lovers, parks filled with parents and playing children, and ultra-chic Parisiennes sporting the last word in fashionably enormous eyewear. Feds to Require International Visitors Be Fingerprinted Before Leaving U.S.
And that’s just a quick grab from the latest in the pot. It’s actually a lot more dire and getting worse by the day, if not by the minute. But, stop the presses! A show of photographs in Paris just might depict life went on as usual while Jews were dying! Yeah, no doubt – life WAS going on as usual – as it is now; Jews were dying then – along with millions of others, and Palestinians and Iraqis and Africans and others all over the world are dying now; the Nazis were evil bastards. How dare they show that anyone else was enjoying life while the Jews were dying? Well, how dare anyone even consider living or enjoying a normal life while millions of Iraqis and Palestinians and Africans are suffering the same damn thing going on right now??? Give me a break fer cryin’ out loud! Despite the photographs’ propagandistic intent, curators note that their esthetic quality – not to mention their rarity as color prints from that period – make the case for their display. Indeed, even Girard noted that “had it been clearly explained to the public that these were propaganda photos on display, the exhibit could have been very interesting.” While most photos clearly present an idealized and flattering picture of occupied Paris, other shots featuring Nazi flags, German installations, and huge numbers of uniformed soldiers mingling on familiar Parisian streets leave little doubt as to the actual context. Duuuh! And will we have future photos of all the happy people in New York with the machine-gun armed protectors standing about in the background leaving little doubt about what is going on?? After the Nuremberg Trials that blacken the names of Americans and Israelis and their Axis of Evil, and all the complacent, do-nothing people who stood by and watched, will someone challenge the idea that life could possibly have been “normal” now? Well, I don’t know about you, but it is not normal for me and never will be as long as this evil poisonous miasma of blindness persists. As long as the pathological fascist evil exists, as long as the Naked Emperor struts down the street defying anyone to pronounce that he is naked, I will point my finger and stand for the truth. That may be all I can do, but as long as I can do it, I will. Sorry, lady, but that IS how it was for a lot of people. And even moreso today. What’s more, the dying part is how it was for about 50 million other people back then who didn’t happen to be Jews, but I don’t hear a lot about them. Did you know that Poland lost over 6 million Poles and that only about half of them were Jews? When do we ever hear anybody talk about that? Where is their “Holocaust Museum”? Indeed, truer words were never spoken, but I doubt that they were spoken in truth. People should, indeed, be more explicit in laying out the darker context of our reality; that’s the one thing people can never be reminded of too often. And that’s what sott.net does, every day, remind you of the darker context of this reality in which life goes on… for some.